Eleven piece set consists of three cooks knives, bread knife (serrated edge), sharpening steel, carving fork, tomato knife (serrated edge), two plain edge paring knives, serrated edge paring knife, potato peeler. 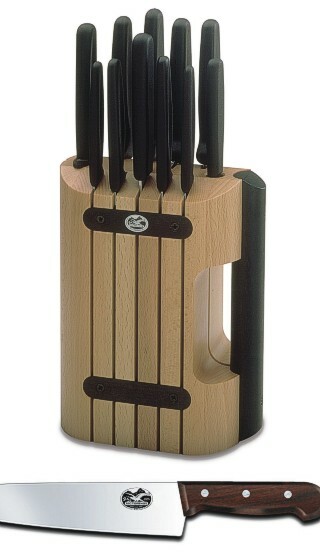 Block is made from managed timber, knives are with Rosewood handles. The Victorinox brand is extremely well known and their chefs knives are the finest quality blades available for the kitchen, whether for professional or for every day use. Their scissors and gadgets knives are also made to equally exacting standards.